Photograph taken from the top of the Aalborg tower in Denmark. North Denmark is home to a web of companies within the MedTech and WelfareTech industries. Our expertises include medical devices, medical informatics, neurorehabilitation, health-IT, pain research, motor control, assistive and rehabilitation technology, tele health, imaging and clinical research. The business community in Aalborg thrives. 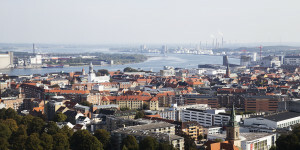 Large international companies like Siemens and Samsung have chosen Aalborg as a preferred location for their activities. Invest in Aalborg provides advice and service for companies considering Aalborg as their next/new location.